These doors are just beautiful but you do have to be careful handling especially during installation. I put these in a nice rental property and they have stood the test through 2 families who resided there. They are as functional as they are pretty and so easy to clean. you will not regret the purchase. Not bad for a sliding door. Great price, quality, and easy to clean. I especially like the fact that you don't have to worry about the door accidentally slamming like the hinged versions of the glass shower doors. I built the entire 60" shower stall (low profile to floor) & did tile work myself so I was reluctant to try some of the other products friends had installed with poor fit (leaking) results. This was an easy install except for the drilling of the required support holes through the porcelain tile. My 90 lb wife was my only help but it was a breeze to hang the final sliding door & it required minimum adjustment. We were looking for a mostly frameless sliding shower door. This one was easily installed, easy to move back and forth, and more than satisfactory. I would recommend. I used this beautiful frameless sliding show doors and two bathrooms in my house that looked shabby with shower curtains. I mounted them on the top of the tub and now the modest guest suite bathrooms look very high end. The quality is excellent - they roll well - and look awesome!! This is the 2nd one we have bought. They are stylish and a great value. Better product than home improvement stores and the very heavy box I'd delivered straight to your door free! The Infinity-Z model is composed of a single door and stationary panel. Our shower doors are designed not to leak when properly installed. Ideally you would install this door on the shower head side so that the gap between the door and stationary panel is opposite from the flow of water. 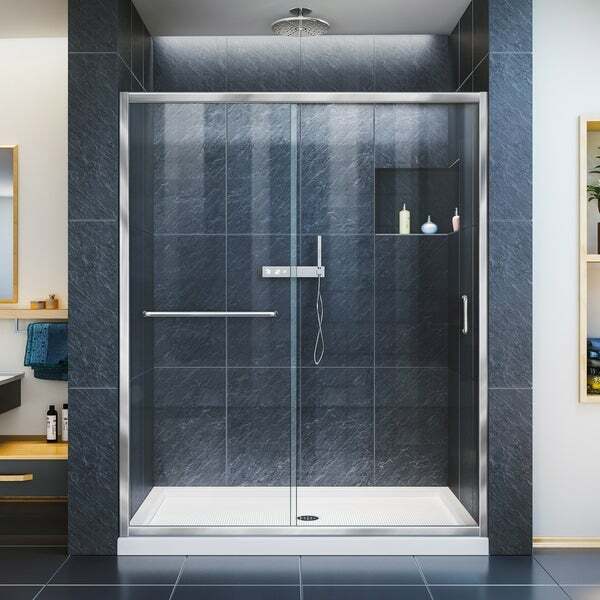 Vinyl seals are provided in the event that you must hand your door opposite of the shower head. If you require replacement rollers, please contact DreamLine. We installed this in the masterbath shower and love the weight and quality feel. It blended into the bathroom nicely and was a much better option than overspending on a "frameless" door. Would buy another if needed. Thanks again Overstock! Love my new shower doors! We pulled out our tub/shower combo and had a walk-in shower installed. I researched extensively and found this door. It was a good price and i really like the way it looks. I didn't want a totally frameless door because they seem flimsy to me. this one has a frame but is very sharp looking. This is a nice door for the price. It was definitely a two person job to assemble it and get it in place in the opening. When you open and close the doors, there is a little wiggle to them but they seem to be sturdy so I think that might just be how this type of door works. Shipped to home, no problems. Everything in tact when opening. This was my 1st shower door install, no problems at all. Follow detailed instructions and you will be fine. Check out online instructions for additional help. I checked cost of doors online prior to purchase and Overstock had best deal. Would highly recommend! When I first received this one of the doors shattered while installing. The company was great, they replaced immediately no questions asked. It looks great installed! The door looks great. Unfortunately, within 6 months the rollers holding the door up broke. Love it! Absolutely perfect and easy to install. Thank you! Sliding shower door exploded into a million pieces while my husband was rinsing son's hair. Minor injuries. Paid for a professional installation. This shower door is perfectly what I wanted. It made the bathroom look so much larger and modern. A new coat of paint and new toilet the bathroom is like a whole new space. Love it! "Hi- I purchased this door and I need to get 2 extra roller for it. How can I get parts?" "I have a 53.5 inch opening, would this door work even though it is listed as 56-60?" Hello johnsobe, while this door can be adjusted down to 53.5 inches, it would leave you with a very small walk-through opening. It is not recommended to install this door in a space less than 56 inches. Thank you for shopping with us! "Can the door be on the left side instead of right like the one shown in the picture?" Hello AndrewVisosky, yes, this door is reversible for right or left door opening installation. Thank you for shopping with us! "My shower door opening is only 51 inches wide. Will this door work and the doors will simply overlap a few inches more than shown in the picture?" Hello Brenda, this door can be installed in a 51 inch opening. However, it is not recommended to install in an opening this small because the opening to get into the shower will only be 17 inches. That is a very small opening to get into the shower. Thank you for shopping with us! "How can a sliding glass door be frameless. It has to have a track that it sits in thus it can't be frameless can it? If it isn't frameless the item description should be corrected." Hello elaine0548, by frameless we mean that the moving door panel does not have a frame. The entire item can have a metal frame. It is just the moving door panel itself is frameless. Thank you fo5r shopping with us. Thank you for contacting us, amynixoverstock. The glass is 0.25 (6 mm) tempered glass. Please let us know if you have any further questions.